When I think of tarps, I think of the blue 9 foot x 12 foot tarp I use to throw over a lawnmower to protect it. I also have one of those in my long-term bug-out stash. That is a functional tarp but very bulky and heavy. It is not what I would put in a camping or short-term bug-out backpack. Hence the need for a camping tarp. 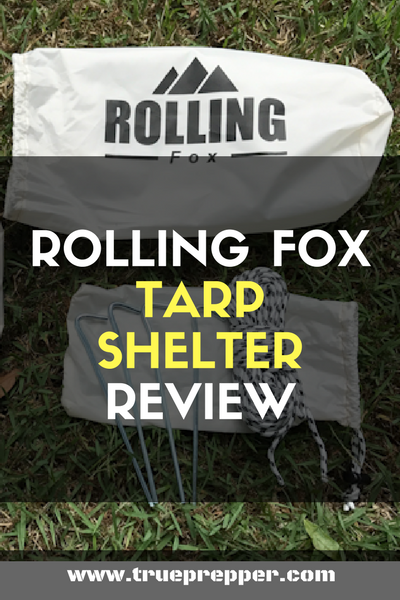 The Rolling Fox Tarp is a very light-weight and adaptable tool for use when weight matters. It is basically a very well-constructed cover that is designed to protect you or your supplies from the elements. It can be used instead of a camping tent or a regular tarp. This is one light and tough tarp! I was impressed by the double-stitching, the 3 extra loops per side to pass rope through, and the inclusion of ropes and stakes. I believe this is all you would need to keep the elements off in an emergency or just when backpacking. While the tarp is very light and thin, it feels substantial. It easily fold and rolls up to fit in the included bag. The paracord is a quality addition and it grips so well that you only need to tie one knot in it (rather than a square knot). It dawned on me pretty quickly that this tarp (and any tarp) needs one high point to be effective. Otherwise it will be too close to the ground. Ideally, it could use 2 high points. That means tying to a tree or post as high up as you can. This product would be better if it came with or was bundled with a collapsible post that gets a corner off the ground. As it is, just throw some extra paracord over a limb and it works great. Another thing they got wrong is that the tarp blocks the sun, but not the heat. I sat under it fore a few minutes under a bright coastal sun and about melted. Maybe it is the off-white color that makes it hot. 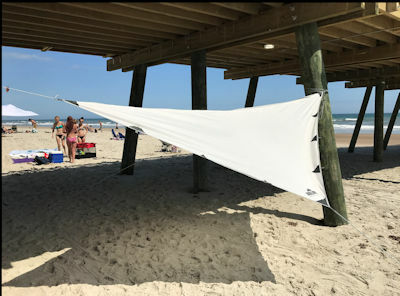 Just make sure that you have a breeze blowing on you (or get more corners high so the breeze goes under the tarp) to stay cool. We always try to include the ‘cons’ for every review, and coming up with a few for the tarp was difficult. My testing included setting the tarp up in four different coastal locations: a quiet yard, over a picnic table in a park, a windswept ridge, and under an ocean pier. I monitored the effect of wind and sun. I also sprayed it with a hose to see if a piece of cardboard under it got wet. The tarp held up while being stretched and pulled, exhibited strength and stability, and shed water easily. The cardboard underneath remained dry. I left the wet tarp up for another hour and it was completely dry. It passed all my rigorous testing with ease. Water just rolls off. Cardboard underneath stayed dry. At a cost of $50, I thought this tarp was somewhat expensive. But if you consider that it could replace a tent that costs hundreds of dollars, it is a great value. I will carry this tarp in my backpack when hiking to the tops of mountains and I’ll barely know it is in the pack. I’ll carry extra paracord to get it up nice and high and use it as a sun, rain, and wind shield. And when I say I’ll use it, I mean I’ll take it every time I go. For prepping purposes, it is a valuable emergency tool to stay warm/cool and dry. I recommend it for both bug out bags and camping use. 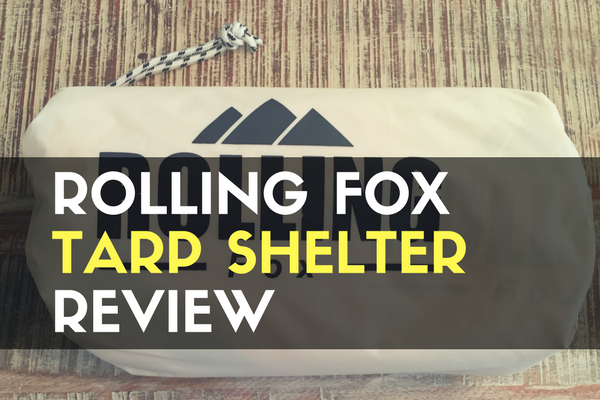 Thanks to Rolling Fox for providing the tarp for review- be sure to check out their website for more info. They also have articles and reviews on other camping items. 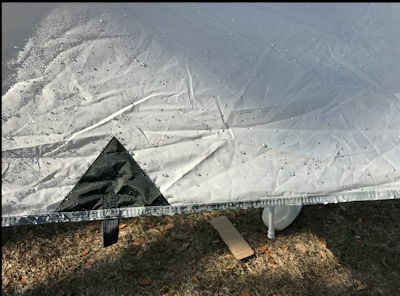 HERE is a blog post from the Rolling Fox site that shows some ways to set up this very tarp. 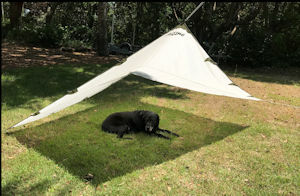 Sometimes you can catch the tarp on sale for around $35 on either site below, which is a great deal. The best way to stay up to date with our reviews is to sign up for updates by subscribing to TruePrepper, or by following our Facebook page. I have experience from years of actual prepping, including survival food, tools and weapons, and even a buried bunker. I am an Air Force veteran that began thinking about surviving disasters during the Cold War when the Soviets threatened mutually assured destruction. Trained in Red Cross disaster assistance, Community Emergency Response Team, and radio communications. Join the 16,719 practical preppers that follow our articles. 0% Spam, 100% Prepping. TruePrepper is a collection of prepping guides, articles, and reviews by survival experts since 2016. Have a question? Just ask. All content on TruePrepper is copywrited. All rights reserved.